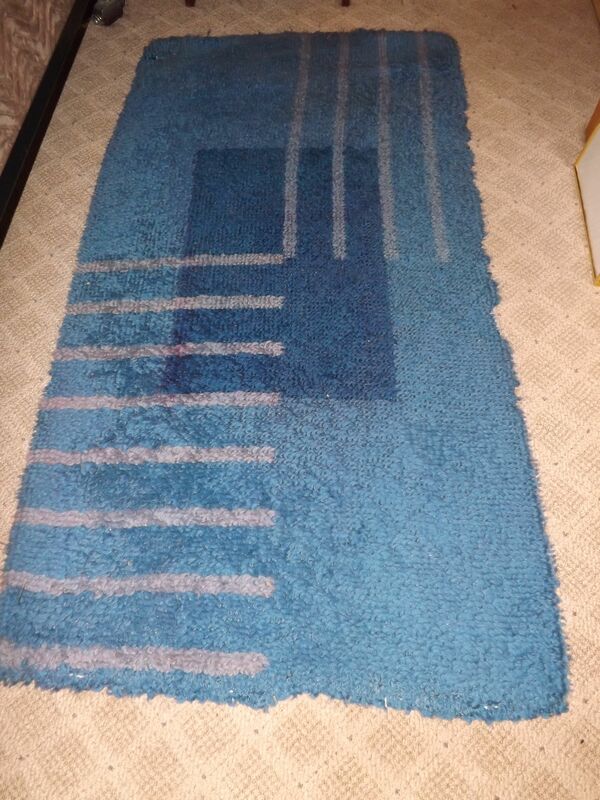 There’s a blue hooked rug beside my bed. I step down onto it each morning and each morning I think of my dad. He made the rug in 1946, just after the end of World War II. He was living on the psychiatric unit of a hospital in Germany at the time, after joining in the liberation of Bergen Belsen, one of Hitler’s notorious death camps. What he saw there made my father’s mind stop and his soul shrivel. It would be many months before he was well enough to leave the hospital. He worked on the hooked rug a little each day. It was one of the few things he brought home with him when he returned to Canada. His only surviving souvenir, it was more precious to him than the medals he received. I often wondered about that, wondered why he would hold it so close. I never asked because he didn’t like to talk about the war and very few people knew he’d spent time in a psychiatric facility. My mother warned me not to mention it when she told me where the rug had come from. But I think the reason he prized that hand-made item was because it had been part of his healing. As his hands performed the simple act of forming bits of blue wool into a pattern on a loom, his mind began to heal, his soul began to be restored. Todd Henry, founder of Accidental Creative once said “The creative process is a daily assault on the beachhead of apathy.” I believe it can be more. I believe it can be an assault on the evil and imbalance in ourselves and in the world, a beachhead against chaos and destruction. I believe that as we write, as we sew or knit or quilt, as we paint or sculpt or weave, we are healed, we are made more whole and we draw closer to the Divine Spirit that guides us on. We also remind ourselves and those who will read our words or enjoy our created things, that complete health, in mind, body and soul, is the state in which we were meant to live. Thus hope is breathed out, made literal in words, in blankets, in hats and paintings and all artwork, and we are all encouraged. evil one who is set on destruction, and flows with the purposes of God. And, as Oswald Chambers is quoted as saying: “If you agree with God’s purpose He will bring not only your conscious life, but all the deeper regions of your life which you cannot get at, into harmony.” (Oswald Chambers, from Called of God in The Complete Works of Oswald Chambers) That is true health, true holiness. “Therefore, my dear friends … continue to work out your salvation with fear and trembling for it is God who works in you to will and to act according to his good purpose” Philippians 2:12,13).